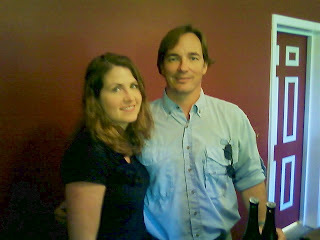 The 2011 North American Wine Bloggers Conference wrapped up Sunday in Charlottesville. Over 330 self-proclaimed wine bloggers visited the city for the three day conference at the downtown Omni Hotel. The group also toured several central Virginia vineyards and had dinner Friday night at Monticello. This is the first time the conference has traveled to the East Coast. Allan Wright, one of the wine bloggers conference organizers said, "When we announced Virginia as the location of this year's conference, there was a lot of skepticism, and I have to say I was not entirely confident myself in how it would go, but as we got closer and closer to the date, all that disappeared." One of the biggest topics of discussion at this year's conference was the explosion of new vineyards. And the bloggers say social media can help a struggling winery reach new customers. Next year the conference heads to Oregon. 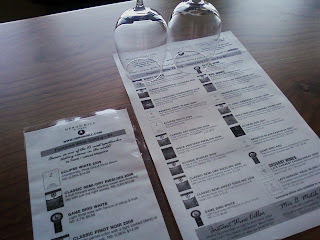 While we were near Canandaigua, we decided to visit the Heron Hill tastingroom in Bristol. I have long been a fan of Bernard Cannac. After getting an Associates Degree in the Food Industry, he went back to his passion, making wine. He graduated from The University of Bordeaux in 1995 with a Bachelors Degree in Oenology, called “Diplôme National d’Oenologie” or D.N.O. Continuing on with his travels, Bernard went to Burgundy to get a M.B.A in International Commerce of Wines and Spirits. After spending a few harvests in Southern France, from Saint-Emilion to Provence, he set course to Virginia in 1999 for a year-long internship. That is where he was introduced to the American way wineries operate. Bernard then landed on Long Island for the 2000 harvest. Still single at the time, he met a wonderful woman who changed his life plans. Bernard and Lisa married in 2003. Bernard spent nine vintages on Long Island as winemaker in various wineries there including Castello di Borghese, Comtesse Therese Winery and Galluccio Family Winery. He also spent time consulting for others. While at Galluccio Family Winery, his Chardonnay scored 90 points from Wine Spectator and as winemaker for Comtesse Therese Winery he was awarded “Best Merlot in NY” at the NY Wine & Food Classic. Bernard and his wife Lisa now reside in Hammondsport, New York. Owners, John & Jo Ingle met during the late 1960’s, on the first day of school at the University of Denver. 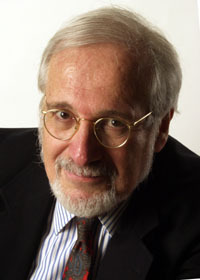 John studied to be an English teacher and graduated in 1971. By this time, however, he was reading organic gardening magazines regularly and had been bitten by the “back to the earth” bug. After marrying in June 1971, John and Josephine went looking for their promised land. Colorado,Wyoming, Montana, Alberta, British Columbia, Washington, and Oregon all received consideration but the two recent grads landed in John’s backyard – Seneca Point, Naples, New York. Spring of 1972 saw the Ingles plant 20 acres of grapes, including Chardonnay, Riesling, and Seyval Blanc. They planted some 12,000 vines. They built Heron Hill Winery on Keuka Lake. 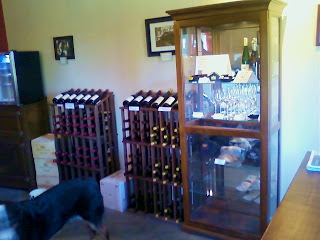 Being next door to Walter Taylor’s Bully Hill Winery and Dr. Frank’s Vinifera Wine Cellars seemed like a good location. It has been, too. 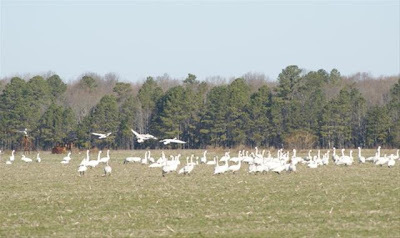 2009 marks the 32nd anniversary of Heron Hill. In the meantime, they have opened up tastingrooms on several lakes. We pulled into the drive way as Josie Ingle was just putting out the OPEN flag. She greated us with a great big smile and bade us welcome. She was bright, energetic, and charming. 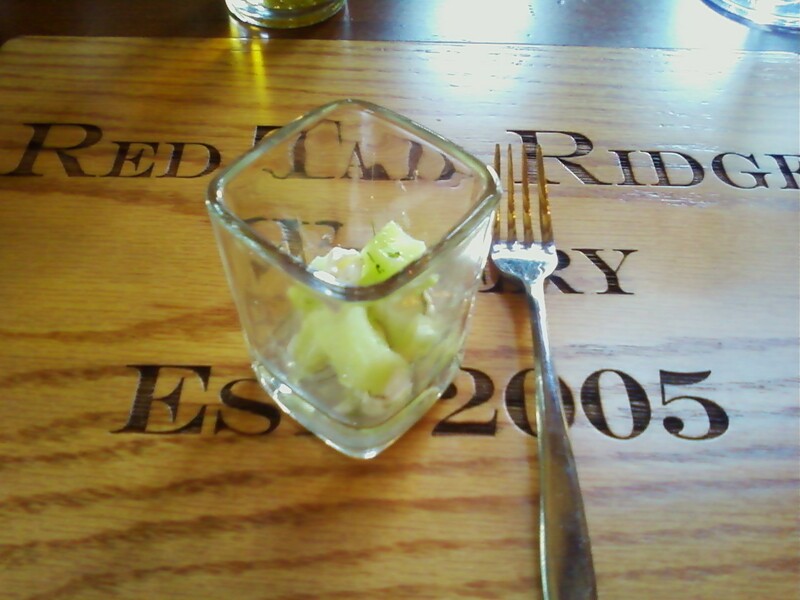 The first thing I tasted was the 2008 Ingle Vineyard Riesling. This was a nice, bright, fresh riesling, with subtle minerality with lots of lemon and citrus. 2008 Ingle Vineyard Chardonnay Unoaked came next. I liked this as well. As promised, the crushed granite, lemongrass, and green apple skins all came through. 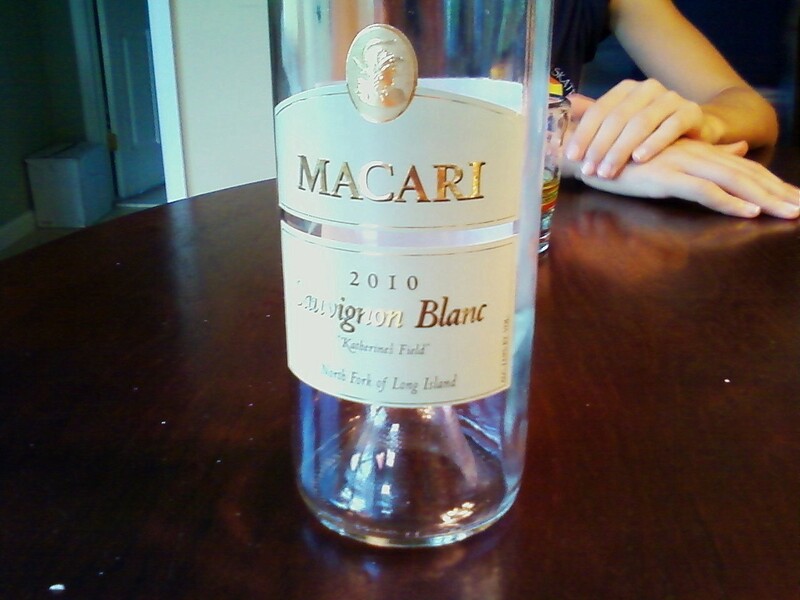 There was a beautful balance here, where the fruit and the acids balanced out. Next came the 2007 Ingle Vineyard Pinot Noir. I've neen tasting a lot of noirs lately, Pinot and Baco, so I was especially interested to see what Bernard had crafted. This was a nice, Burgundian-styled Pinot. Raspberry and strawbeery wafted out of the glass, as promised. Bernard makes it in small European oak barrels. The result is a well balanced wine with hints of vanilla and other spices. The 2007 Pinot Noir Reserve was even better with dark stewed strawberries and dark raspberries. Lots of spice and minerality as well. A very nice Pinot Noir, especially for the Finger Lakes. Lastly I tried the 2008 Ingle Vineyard Cabernet Franc. This is a relatively big Cabernet Franc, especially for the Finger Lakes. Cherry and dark raspberry comes through, as well as a hint of cassis, and touches of mocha and other spices. Very, very nice! 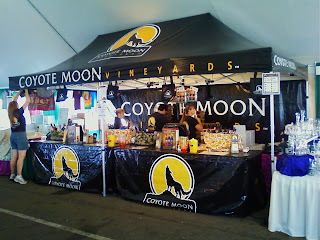 They didn;t have their Baco Noir Reserve, which I would love to have tried. And I didn't try my usual favorite, Eclipse. But as usual, I liked the line immensely. Always a treat to see what's going on with Heron Hill. 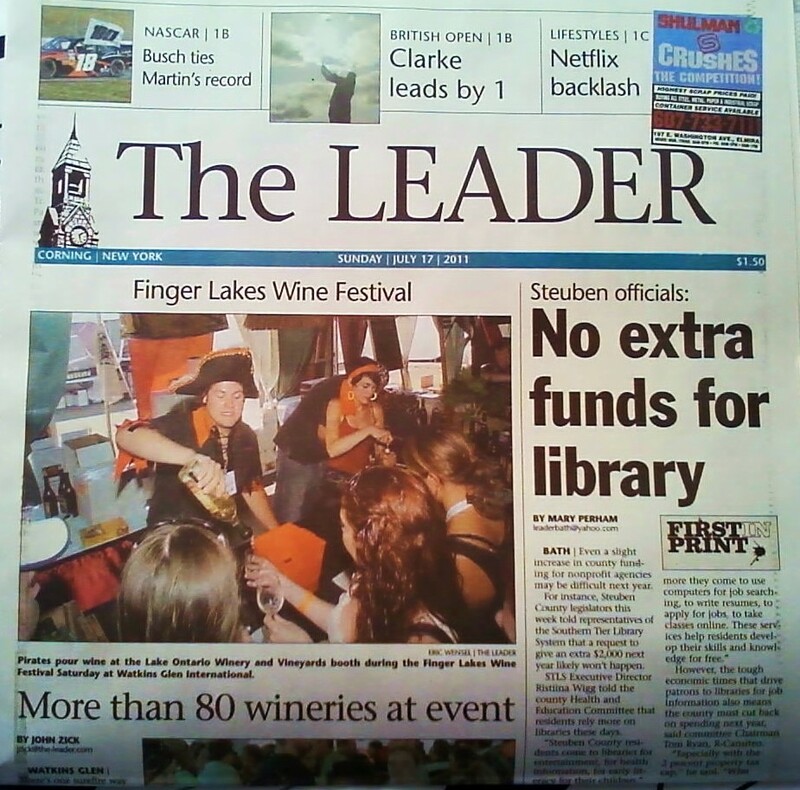 Went to the Finger Lakes Wine Festival again in 2011. Some new faces and some od faces. Had a great trip. Ate at the Canadaigua Culinary Center twice in one day - luch with NYWGF's Jim Trezise, and dinner with wine book author Evan Dawson, who wrote SUMMER IN A GLASS. And his lovely wife Morgan. 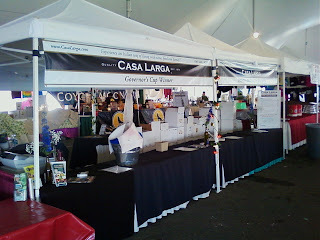 Lot's of great booths at the fest! 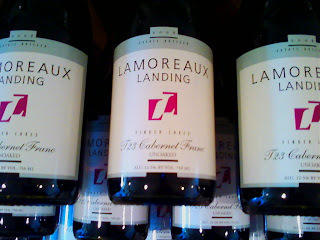 Great tasting at Lamoreaux Landing! 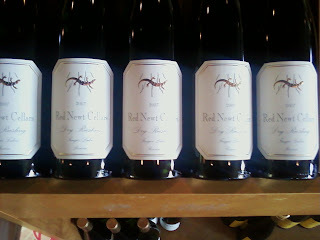 A visit to Red Newt! A great tasting at Heron Hill! 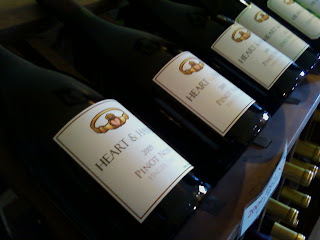 A fantastic tasting at Heart & Hands! Awesome Pinot Noir and Riesling! So, I finally made it to Heart & Hands to see the place where the magic is made. Let me state at the outset that the two best Pinot Noirs made in New York are Heart & Hands and Oak Summit. All the rest is nice, and good, and very delicious, but these are the two best - hands down. 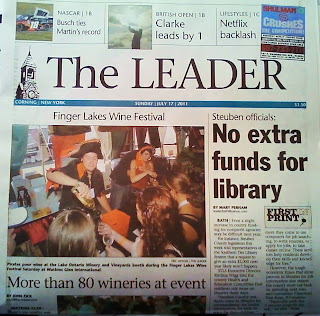 The winery is on the upper, eastern shore of Cayuga Lake, which is to say, it's way the far hell away from Watkins Glenn or anywhere else I usually go in the Finger Lakes. So it's hard to get there, which is always bothersome to me. But it is what it is. The winery is what I expected it to be. A small, tastefully done building, with many features of a larger winery in a smaller winery. The tastingroom was handsomely painted, as if it were someone's living room, with tones of maroon and a buttery light yellow, with lots of wood tones. Very, very tasteful and handsome, like something out of Traditional Home magazine. And Tom and Susan Higgins are a handsome couple. More importantly, they are very nice, and committed folks. Tom is the winemaker, and Susan is sales and marketing. Together, they are a team like few other couples. Tom and Suan welcomed us, and were very friendly from the outset. 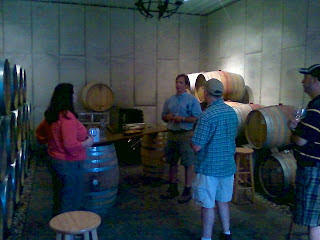 After some chatting, Tom took us to the barrel room and gave us tastes of his different barrels. Each barrel was different. Single clones in one. Whole cluster fermentation in another. 50% whole cluster fermentation in another. We tasted relatively new wines, and reserves still in the barrel. Tom takes his winemaking very, very seriously. For such a small winery, he takes every care he can, and is exacting in his preperation and detail. The barrels room is fill with crushed stone, and is modulated by the earth's temperature. The room breathes enough for the proper humidity. Tom has man of the latest gadgets, but has enough old world in him to be a solid blend of the two. The whole cluster wines to me were the most expressive and complex. Really beautiful, with deep cherry flavors, with river stones, and shale, firm tannins, and the rounding influence of French oak. On the other hand, the 50% couser wines showed brighter fruit, with intense flvors and lovely soft tannins. And the barrel reserve was incredible and complex, elegant. Impressive. Tom could talk about each barrel and what happened to it, and how it came to be. The fact that it was all Pinot Noir was what was striking. Tom is like Picaso in his Blue Period. He paints, as it were, with basically one color. But he explores the depths, the brighteness, the hues, and the uses of that one color so as to create an entire palate of smells, tastes, and nuances like few winemakers I have seen. Tom is happy to bring bottles of his barreled wine to other winemakers and wine writers, soliciting advice and opinions. He is obsessed with getting the final blends just right. It's almost hard to drink wine so personal, so intense, so meaningful. One wants to give the wine their full attention, giving each wine's gravitas its due. One is almost afraid to just enjoy the wines for wine's sake. But I have to tell you - they are all that good. And you are defintely seeing the grapes in the hand of a master. Heading back to the tastingroom, with their large Bernese Mountain dog, we hunkered down to the grotesque task of having to taste the delicious wines that were already confined to green bottles. It was a hard job, but someone had to do it. Firstly, unbeknownst to me, Tom also makes riesling! One gets the sense that it's almost against his will - like he's cheating on his firs love, Pinot, to spend time with this new mistress. He does not have the same passion for the process, as he does for the Pinot. But he has the same obsessiveness to make it beautifully. The Dry Riesling is incredible, bright crisp, clean. It's easilly one of the nicest dry rieslings in the Finger Laeks. And his Riesling, with a hint of sweetness, and scents of pineapple and apricot, is out of this world!!!! Then we get to the Pinot Noir. Wow! 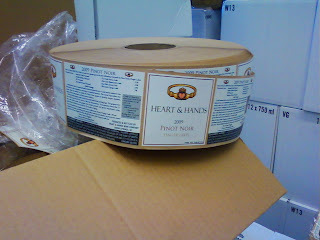 The 2009 Pinot Noir is full of cherries and with a hint of smokiness or earth. There is a lot fo there, there. 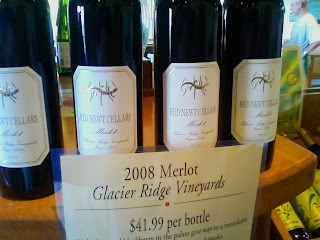 At $19.00 a bottle, it's a steel, and I curse the fact that I can;t buy two cases immediately. It's intensity and careful crafting comethrough in every sip, and when I close my eyes, and smell the wine, I wonder if I am back in the Santa Ynez Mountains drinking Pinot in lower California. Incredible. The next wine is the Barrel Reserve. If the Pinot Noir is bright cherry and fruit, this is a dark raspberry, medium-to-dark cherry Pinot Noir, with hints of spice, old leaf tabacco, and incredible whiffs of dark bean vanilla. This is rich, complex wine, that is elegant and fantastic! Both these Pinot Noirs could compare with their California or French cousins, and do so favorably. That is not hyperbole. These are quality wines that have arrived. Tom and Susan Higgins are creating something wonderful up on the far corner of Cayuga Lake. Something magical. You must go there and experience their wines. I was up in the Finger Lakes last week, not the least of which, I was up for the wine festival that was held there last week. 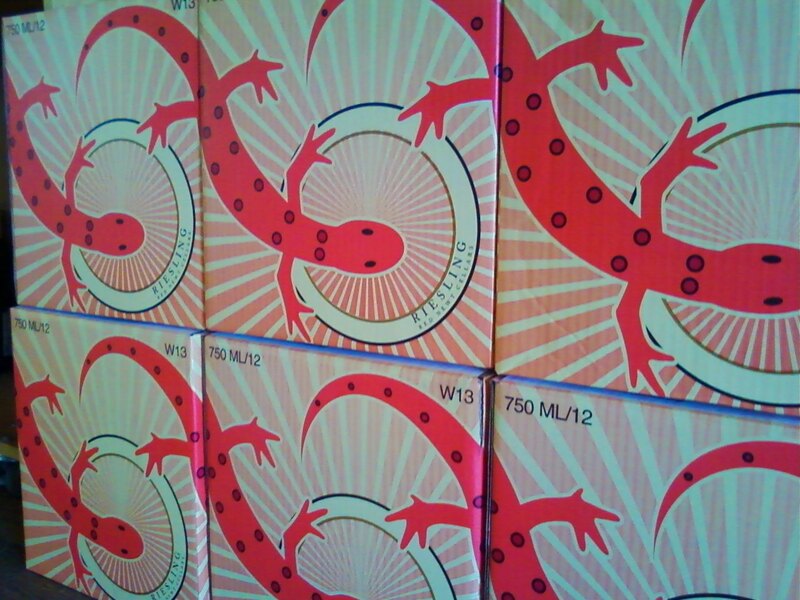 But one of the major things on my "to-do list" was to visit Red Newt. 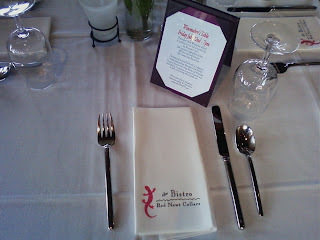 Firstly, Red Newt is always on my "must go" list almost any time I am up in the Finger Lakes. The restaurant is superb, and the wines are incredible. However, where I usually yank the door open with abandon, zealous for the culinary delights awaiting me inside, I opened the door more curious and with the sense of opening up a church door this time. With the passing of Deb Whiting, mine and my friends' visit was as much an homage to her, and to her husband Dave, as it was a visit down a wonderful culinary yellow brick road. There were gentle reminders of her passing. 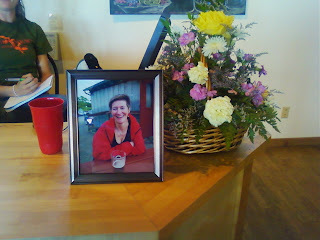 Photos of her and with Dave set next to small bouquets of flowers. For those who had met her and understood her importance to the New York wine industry, they were well placed but not intrusive. They were kind reminders, memorials. The diningroom was half filled, and as we ate, more people came in. The restaurant was abuzz with activity. People ordered sandwiches and meals, salads and desserts, and of course various wines. In the tastingroom, people milled about, tasting wines, and buying t-shirts and hats. 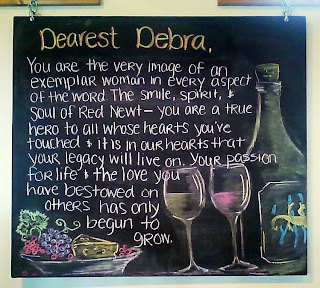 And there, on one of the walls, was another tribute by the staff, to Deb. We tasted some wonderful wines. The Glacier Ridge Vineyard wines continue to impress. I am a big fan of the Cabernet Franc, and Merlot (new to me anyway) did not fail to impress either. Big red, ripe fruit, with lots of plum, dark raspberry, and dark cherry, and a hint of plum and vanilla. A wonderful, well balanced red. Very well made. Elegant. The 2007 Dry Riesling was also exceptional. Bright, with crisp granny smith green apple and a nice, citrus ending, this was a stellar wine. Lots of mineral textures. Refreshing and light. Fabulous! 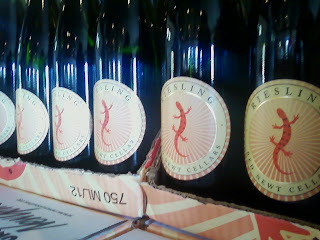 And of course I couldn't sneak out without a taste of the circle label riesling either. Always a dependable, classic riesling. But there was something odd in my visit, that I could not get my head around until after I had long left it. People were laughing, eating with joy, drinking wine and chatting, and the business of the winery hummed. And remember finding it discncerting. After all, a wonderful activist, someone who had truly made an impact, had slipped through our fingers. Why wasn't the tone more sombre? More respectful? 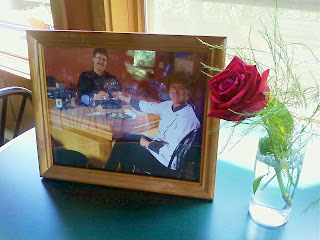 And of course, the ultimate tribute to what Deb and Dave built is just that. 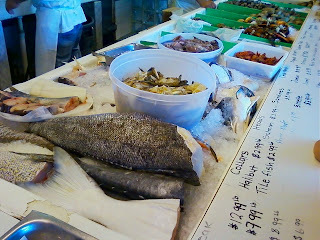 They had created their own little culinary Oz, and the laughter and good times that go along with great food and great wine will far out distance anything thing we can write. The laughter and happiness that those folks expereince as they experience it is the real tribute. Anything with a high alcohol content! Just kidding. I would have to say a good quality Burgundy. I enjoy Burgundy, but I'm not really sure why. Perhaps in my last moments I'd be able to figure it out. Or perhaps Burgundy is some sort of metaphor for the afterlife, "we dont understand it, but it's going to be good." Unless of course you committed a crime that landed you on death row, then the metaphor would most likely come in a box with a pour spout at the bottom! What region produces the best wine in your opinion? Being a New York Wine producer, I am partial to the quality, character and diversity of the wines produced here. Aside from New York wines, I often find a bottle of wine from the Loire Valley in France sitting on my table. Like New York, these wines are delicate and balanced and have a sense of place. It is their subtleties rather than their boldness that makes them shine at the dinner table. Local winemakers have been facing uncertainty about the future of their vineyards since December, when a federal court of appeals ruled that it was unconstitutional to allow in-state wineries to sell directly to retailers and in tasting rooms while requiring others to go through wholesalers. 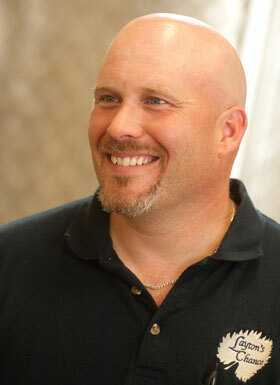 Staff photo by Tim HawkNew Jersey wineries are waiting for the ax to fall. Since then, state lawmakers have been unable to pass a bill that would protect these businesses, an important part of New Jersey agriculture. Senate President Stephen M. Sweeney backed a bill that would allow state wineries to keep their tasting rooms open and ship their products directly to consumers’ homes. But Assembly Majority Leader Joseph Cryan — though he supports the tasting room business — wants to require wineries to work through distributors. The bill was not passed by the time lawmakers departed for their summer recess last week — an issue that’s making most vineyard owners uncomfortable, if not downright angry. Unlike owners of wineries who started as farmers and converted to winemaking for the “cash crop,” Donnini and his wife were both Philadelphia lawyers who decided to buy a piece of open land and turn it into a vineyard. “Senator Sweeney’s bill would save our wineries, but the point is that something needs to be accomplished. We need these politicians to get their act together fast,” said Donnini. "Year's Best Finger Lakes" is a feature in the current (August) edition of Wine & Spirits magazine, with 25 wines, mostly Rieslings, rated exceptional (90+) and 10 as Best Buys. 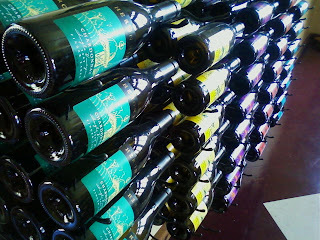 The ratings were based on tastings of 97 wines by Patrick Comiskey. Chateau Frank 2006 Blanc de Blancs (90) was the sole sparkling wine, joined by many Rieslings: Hermann J. Wiemer 2009 Finger Lakes Reserve Dry Riesling (94), 2009 Finger Lakes Dry Magdalena Vineyards Riesling (93), 2009 Finger Lakes Dry HJW Vineyard Riesling (92), and 2009 Finger Lakes Dry Riesling (92); Red Newt 2009 Finger Lakes Circle Label Riesling (93, and Best Buy), 2009 Finger Lakes Davis Farms Vineyards Riesling (93), 2009 Finger Lakes Semi-Dry Riesling (92, and Best Buy), and 2009 Finger Lakes Sawmill Creek Vineyard Riesling (91); Lamoreaux Landing 2009 Finger Lakes Dry Riesling (92, and Best Buy), 2009 Finger Lakes Red Oak Vineyard Riesling (92), 2009 Finger Lakes Round Rock Vineyard Riesling (92), 2009 Finger Lakes Reserve Riesling (91), and 2009 Finger Lakes Red Oak Vineyard Riesling (90); Sheldrake point 2009 Finger Lakes Dry Riesling (92, and Best Buy), 2009 Finger Lakes Riesling (92, and Best Buy); Tierce 2008 Finger Lakes Dry Riesling (92); Anthony Road 2009 Finger Lakes Semi-Dry Riesling (91, and Best Buy); Heart & Hands 2009 Finger Lakes Reserve Riesling (91); Fox Run 2009 Finger Lakes Riesling (90, and Best Buy). The exceptional red wines were Lamoreaux Landing 2007 Finger Lakes 76 West (92), Red Newt 2008 Finger Lakes Glacier Ridge Vineyards Cabernet Franc (90), and Heart & Hands 2008 Finger Lakes Pinot Noir (90, and Best Buy). The exceptional dessert wine is Hermann J. Wiemer 2009 Finger Lakes Late Harvest Riesling (94). Separately, under American New Releases, Heron Hill 2009 New York Semi-Dry Riesling (92, and Best Buy) and 2009 New York Riesling (91, and Best Buy) drew praise. In the most recent wine competition, Amenti del Vino, Lakewood Vineyards 2009 Vignoles and Keuka Spring Vineyards 2009 Chardonnay won Gold medals. Next up, next weekend, is the Long Beach Grand Cru competition run by Dan Berger and Ludmilla Montoya, with proceeds benefiting the Legal Aid Society of Los Angeles. New York wines traditionally win many Golds and top awards in this competition. THE OLD VINES AND THE SEA | Paumanok Vineyards in Aquebogue, N.Y. There may be no word more insulting than "potential" when it's attached to a person or place. After all, its application suggests a certain deficiency of present circumstance. I was reminded of this recently by David Page, a vintner on the North Fork of New York's Long Island, a winemaking region that's been heralded for its "potential" since Alex and Louisa Hargrave planted the first vitis vinifera grape back in 1973. "The word 'potential' implies there haven't been profound wines from this region to date," said Mr. Page, after I mentioned the word. We were standing in Mr. 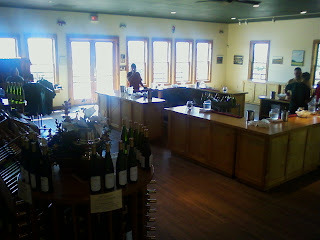 Page's modest but attractively rustic tasting room on Oregon Road in Cutchogue. "Our wines are served in some of the best restaurants of the world," he added. Admittedly, I had raised the question of potential about four years before, on my last tasting tour of the North and South Forks. (The South Fork is better known in non-winemaking circles as the Hamptons.) On my previous tour, I'd found pockets of accomplishment and some good wines, though not many that seemed likely to excite the interest of the world. Or, for that matter, New York sommeliers. According to Kareem Massoud, winemaker of Paumanok Vineyards in Aquebogue, interest in Long Island wines was limited until quite recently. "Four years ago, Long Island winemakers were complaining, 'Why doesn't New York City support us?' " he said. Today, Mr. Massoud counts 50 Manhattan restaurants as his clients, including top dining spots like Prune and Gramercy Tavern, where wine director Juliette Pope features 11 wines from Long Island on her list. What changed, the quality of the wines or New Yorkers' minds? Roman Roth, a German native who has been the winemaker at Wölffer Estate in Bridgehampton on the South Fork for almost 20 years, says he has witnessed a profound shift in the status of Long Island wines during his tenure. "In the beginning we were outsiders," he said. "Now we are trendy." Colorful dry rose's match barbecued ribs and grilled foods like salmon, tuna steaks, lobster, chicken, hot dogs and shish kebabLike summer flowers, colorful dry rosés — pink, coral, salmon, near-red, almost orange — abound at East End wineries. Since they taste like quasi-reds and quasi-whites, they match barbecued baby back ribs and grilled foods like salmon, tuna steaks, lobster, chicken, hot dogs and shish kebab. When temperatures soar, these rosés are lighter, more versatile and more refreshing than reds. Broadly speaking, they are redolent of cherries, raspberries and watermelon. With exceptions — like the stylish, sparkling 2007 Noblesse Oblige ($37) and the 2010 Grandioso ($29) from Wölffer Estate, in Sagaponack — rosés can be drunk from tumblers and even plastic glasses without offending wine snobs. The dominant pinot noir in Noblesse Oblige, a serious bubbly, imparts sophistication; chardonnay gives it bounce; and a splash of merlot rounds it out. The tiny invigorating bubbles propel a briochelike flavor, and the finish lingers. The congenial Grandioso gets its depth and breadth from merlot and cabernet franc, and a measure of its finesse from a small amount of chardonnay. The graceful, delicate 2010 edition of Wölffer’s regular rosé ($16), a perennial favorite among consumers for many years, resembles tangy counterparts native to Mediterranean France. Roman Roth made lots of it: 9,070 cases. Taste Rosé ($18) from Bedell Cellars, in Cutchogue, is light and brisk. Its individual style is partly shaped by small percentages of syrah and petit verdot, which support plenty of merlot and a good bit of cabernet franc. By contrast, the lively 2010 rosé ($17.50) from Clovis Point, in Jamesport, comes only from cabernet franc; it offers a sweet, fruity scent and a nip of lemonlike flavor at the end. The light, brisk 2010 rosé by Shinn Estate Vineyards($15), in Mattituck, has, uncommonly, a rhubarblike edge. One surprise: the 2010 De Rosa rosé ($18) from Roanoke Vineyards, in Riverhead, is so savory it can be drunk at room temperature. 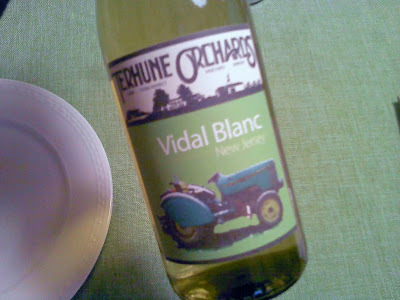 The failure of the New Jersey Legislature to pass a bill that would protect wineries’ ability to sell directly to retailers, restaurants and individuals could jeopardize Terhune Orchards’ Vineyard and Winery. The bill is S2782 in the Senate and A3897 in the Assembly. The Senate passed the bill on July 1 but the Assembly did not. Gary Mount, co-owner of Terhune Orchards, said the bill is a response to a lawsuit filed by California wine interests. The suit claims it is unfair that New Jersey law does not allow other states’ wineries to ship their products into New Jersey. Mr. Mount said because the bill did not pass in the Assembly, New Jersey has not adequately addressed the concerns raised by the lawsuit. He does not know what will happen next because the state Legislature has gone on summer recess. ”What we’re told is that the judgment will come out from the federal courts over the summer,” he said. 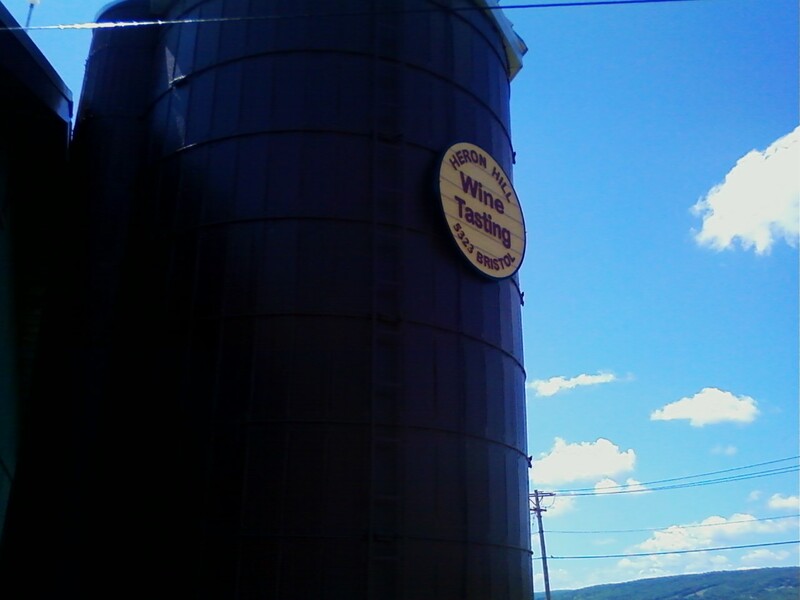 Terhune began investing in its wine business six years ago. Depending on the outcome of the lawsuit, Terhune may have to cease marketing its wine, he said. Mr. Mount said he had planned to sign a contract to build a new winery building at the orchard but no longer plans to do so. ”We won’t invest in that if we might not even be able to sell our wine,” he said. Mr. Mount said New Jersey farm wineries are formulating a plan to address their concerns, but he does not yet know what that plan will be. People enjoy visiting farm wineries, he said. In the sprawling countryside off of Mount Calvary Road, the verdant hills are laced with grapevine. 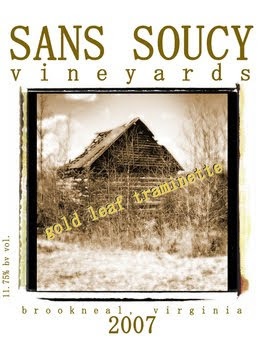 At Sans Soucy Vineyards & Winery, Traminette, Viognier, Cabernet Franc, Petit Verdot and Tempranillo jewels hang heavy on the vines. Sans Soucy means "without worry" in French. And visitors are likely to leave feeling just a little more carefree than when they arrived. 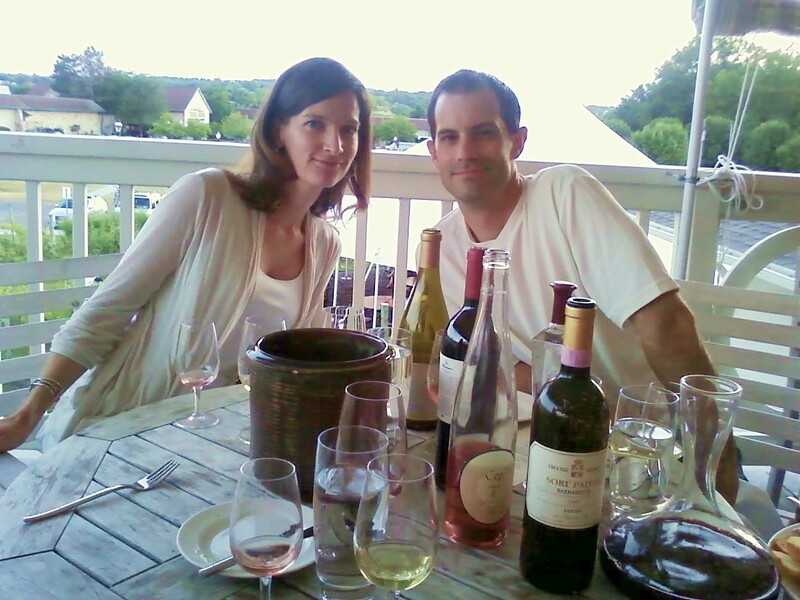 Paul and Jackie Anctil, the owners of Sans Soucy, specialize in something beyond making wine; they've become masters at creating a unique and lingering experience. Paul Anctil, a 25-year retired Marine and his wife Jackie, have traveled the world and lived in various places, including France, Italy and Spain. In 1987, the family moved from Virginia Beach to Brookneal. "We wanted a small community," Jackie Anctil said. Prior to opening Sans Soucy, the Anctils made beer and wine at home as a hobby. They later decided to share their passion for making wine and beer. The process of creating their first vintage began in 2006. Their first yield was aged for two years and released when the vineyard opened to the public in April 2008. 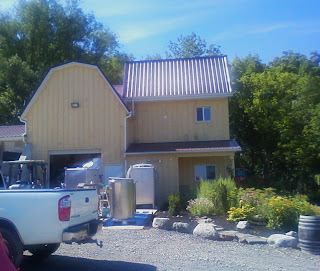 Sans Soucy was the first farm winery to open in Campbell County. In picking the varietals of grapes for the vineyard, the Anctils were careful in their selection. 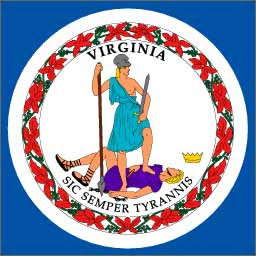 "We took what we liked, along with what worked well with the climate of Southern Virginia," Jackie Anctil said. Since the vineyard's opening, the operation has met with tremendous success. 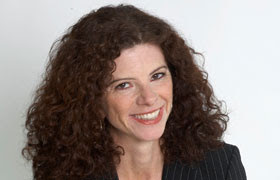 "We've gone from making 500-600 cases to making 1,000-1,200," Jackie Anctil said. The Anctils attend as many as 30 festivals per year across Virginia. The tasting room at Sans Soucy has also been expanded, adding more room for visitors as the front porch has been converted into additional space. Sans Soucy is part of the Southern Virginia Wine Trail (SoVA). 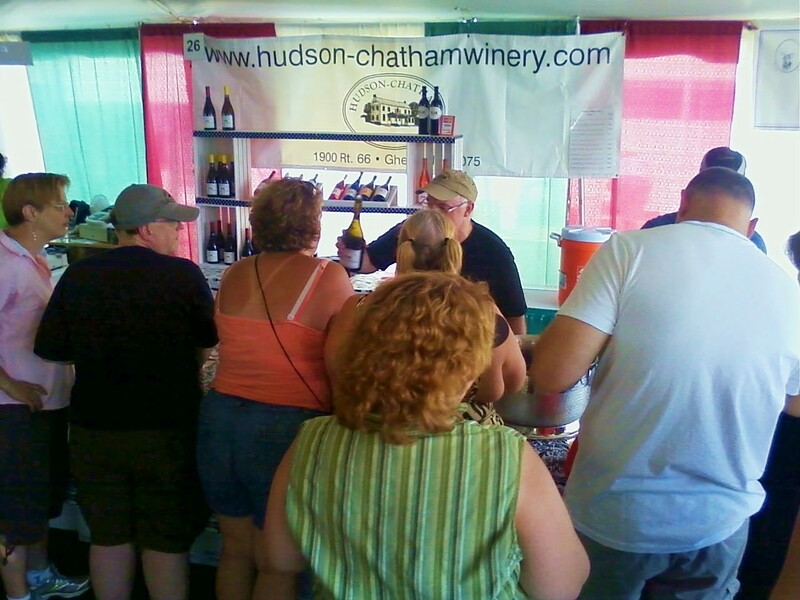 The wine trail currently includes Molliver Vineyards in Nathalie, Annefield Vineyards in Saxe, Bright Meadows Farm in Nathalie, DeVault Vineyards in Concord, Greenwood Vineyards in Vernon Hill, Hunting Creek Vineyards in Clover, Hickory Hill Vineyards in Moneta, Tomahawk Mill Winery in Chatham and Homeplace Vineyards in Chatham. The Anctils have won numerous awards for their wines, including a World Wine Championship Dessert Wine Medal for their dessert wine, Ginger. 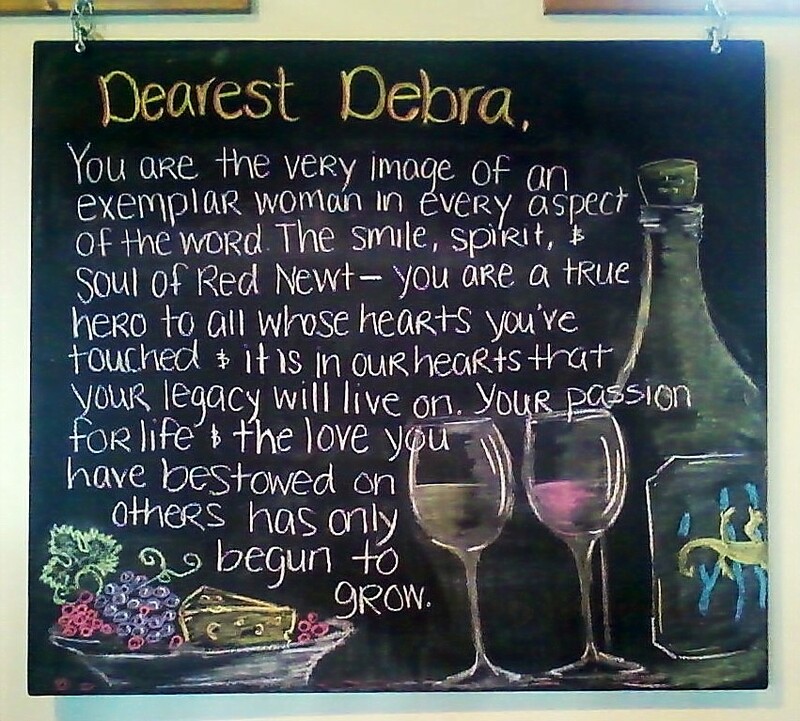 Beyond all their successes, the vineyard is still about passion. "We planted every vine here by hand. We grew them. We cultivated them. There are very few things in life, outside of having your own children, that you get to see this kind of completion in something you started," Jackie Anctil said. The vineyard hosts various festivals throughout the year. The Bark 'n' Wine Festival was held June 4 to benefit All-American Mutt Rescue in Bedford County. Still ahead on this year's calendar is the White Party in The Vineyard July 9, beginning at 8 p.m. Tickets for the event are $50 per person. The White Party is a celebration of summer food and wine pairing. The next Sangria Saturday will be July 16, beginning at 7 p.m. Preston Lund will provide live music. Admission will be free, and food will be available for purchase. On Saturday, Aug. 6, there will be a concert in the vineyard at 8 p.m. Hugh Vaughn will provide live music. Admission is $10 and includes a souvenir glass. Food will also be available for purchase. The Shrimp & Wine Festival will be held Sept. 10 from 12 noon-6 p.m. The festival will include arts and crafts, wine and local food vendors. Live music will be provided by Sick n' Tired and Deanie Blues. Tickets are $15 in advance and $20 at the gate. MONTGOMERY CO., Va. — A Virginia Tech professor is starting a winery just outside of Blacksburg in Montgomery County. It's been Yvan Beliveau's dream to have a vineyard. His first planting was in April 2009 and now he spends much of his time tending to the vines. He and his wife, Joyce, bought 165 acres of land in 2001. 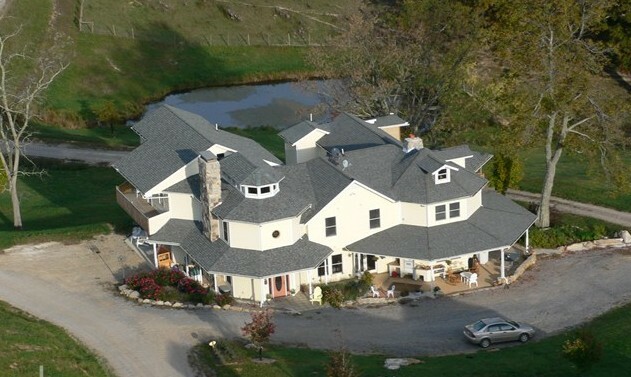 They started a french country style, bed and breakfast and event center named Masion Beliveau four years ago. It allowed them to invest in the vineyard and winery. The vines are still young, but Beliveau will begin bottling wine this fall. "We hope that for at least the first couple of years that all of our sales are from here, that we actually don't distribute. That we hope to maintain. We're not looking to ever become a big vineyard. We'd like to stay in that 40-80,000 bottles a year.," said Beliveau. The winery is under construction and will open in April, just in time for Tech's Spring game. 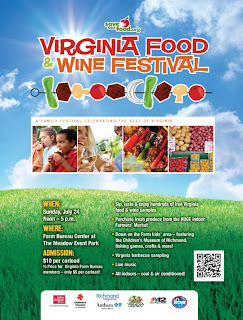 According to the Virginia Department of Agriculture and Consumer Services, there were only six wineries in Virginia. As of 2007, there were more than 130. Although William Layton claims it was a “business decision” for him to come back from the business world to become a winemaker, it seems more like destiny to those of us looking at it from the outside. Located in Dorchester County, the Layton’s were always farmers, but they’ve never been known as the winemakers in Maryland. In 2007, with William’s return, that all changed. William chose which grapes to plant based on which were the most suitable to the climate of the Eastern Shore. He chose the hardy varieties of Chambourcin, Vidal Blanc, Traminette, and Norton. “My favorite of our wines in definitely the Lazy Day White,” comments Layton. 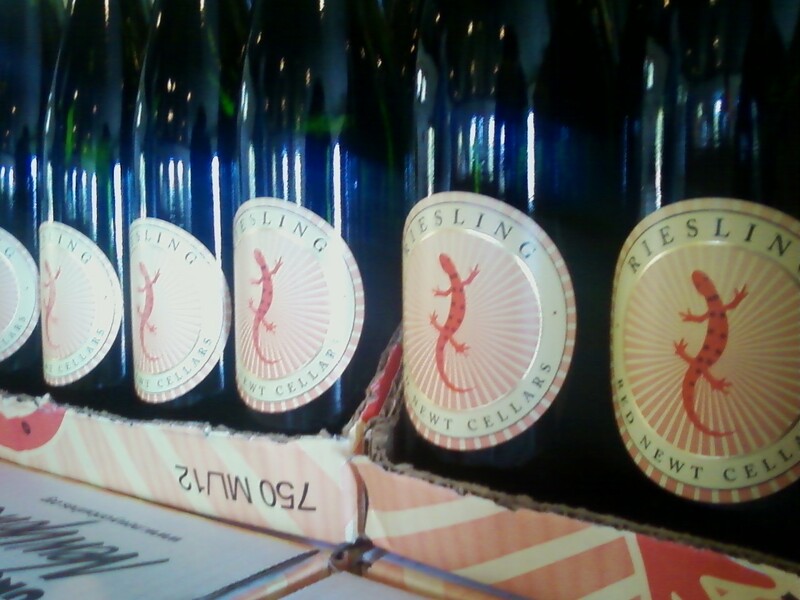 The Lazy Day white is a semi-sweet summer wine, perfect for those July and August nights on the Eastern Shore. Layton knows his inexperience in the wine and grape industry could be seen as a drawback, but he embraces it, choosing to learn on the job and enjoy the whole process. William and his wife Jennifer pictured above.